At the invitation of the Mexican government, President Xi Jinping's Special Envoy and Vice Chairperson of the Standing Committee of the National People's Congress Shen Yueyue will travel to Mexico City for the power hand-over ceremony of the Mexican President on December 1. Mexico is a major country in the Latin American region as well as an important emerging market. China and Mexico are comprehensive strategic partners which enjoy frequent high-level exchanges and strong political mutual trust. We have continuously advanced practical cooperation across the board and maintained in-depth communication on international and regional affairs. President Xi Jinping sending a Special Envoy to attend the presidency handover ceremony in Mexico demonstrates the great importance China attaches to its ties with Mexico. China looks forward to making joint efforts with the new Mexican government to build on the past achievements to promote the steady and all-round development of bilateral ties, deliver greater benefits to the two countries and two peoples and inject more positive energy into the international community. Q: Last Friday, you told us some preliminary information right after the Chinese Consulate-General in Karachi was attacked. Could you give us any updates? What does the Chinese side think of the nature of this incident? What is your comment on Pakistan's response? A: According to the investigation and notification of the Pakistani side, the attack on the Chinese Consulate-General in Karachi on November 23 is a terrorist attack, which killed two Pakistani police officers and injured one security guard. Two civilians were also killed and all the three militants were shot dead. After the incident happened, Pakistani Prime Minister Imran Khan sent a message of condolences to the Chinese Consul General by phone. Pakistani Foreign Minister Qureshi had an emergent telephone conversation with State Councilor and Foreign Minister Wang Yi, during which he informed the Chinese side of the relevant situation and condemns the terrorist act. The Governor and the Chief Minister of Sindh Province, together with the senior officials of the Pakistani military police, visited the Consulate General to express condolences. The Pakistani people from various sectors have expressed sympathy to the Chinese side through different channels. 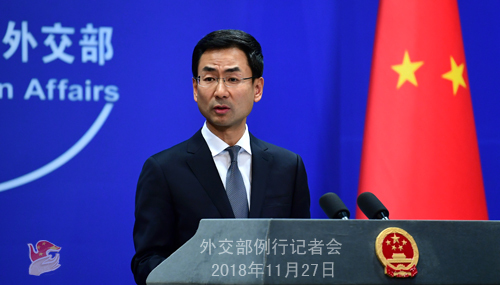 The Pakistani side said that they will do their utmost to solve the case, firmly crack down on the organization who is responsible for the attack and redouble their efforts to ensure the safety of the Chinese institutions and the Chinese citizens in Pakistan and the China-Pakistan Economic Corridor. The UN Security Council has also issued a chairman's press statement to condemn the attack in strongest terms. The Chinese side expresses heartfelt thanks to the Pakistani police for the swift and decisive actions they have taken to effectively safeguard the security of the staff of the Chinese Consulate-General. We deeply mourn for the Pakistani security personnel who lost their lives in the attack and express sincere sympathy to the injured. In order to pay tribute to the heroic deeds and sacrifice of the Pakistanians in defending the Chinese Consulate-General, the officials of the Chinese Consulate-General visited the injured security staff in the hospital and offered solatium to them and the bereaved families. Besides, many Chinese institutions and people in Pakistan, Chinese netizens and the Chinese around the world have made charitable donations on a voluntary basis. When dealing with this incident, the Chinese and Pakistani governments and the two peoples firmly trust each other, support each other and show friendliness towards each other. The facts once again prove that the friendship between China and Pakistan is higher than mountains and deeper than oceans and that our two peoples share weal and woe. China and Pakistan deserve the title of all-weather strategic cooperative partners. I would like to stress that any attempt to undermine the friendship between China and Pakistan is doomed to fail. China will maintain close communication with Pakistan on the follow-up matters. We are convinced that the Pakistani side is capable of upholding domestic security and stability and taking firm measures to earnestly safeguard China's interests in Pakistan and protect the Chinese citizens and institutions there. Q: Can you comment on the recent Iranian media reports that China National Petroleum Corporation (CNPC) is taking over Total's stake in South Pars Phase 11 gas projects in Iran? Does this mean that CNPC has secured an exemption from the US sanctions? A: I am not aware of the specific situation you mentioned. What I can tell you is that China and Iran maintain normal cooperation in various areas and that the cooperation is open, transparent, legitimate and legal. Q: US President Donald Trump yesterday said in an interview with the Wall Street Journal that it is highly unlikely for him to accept China's request that the US hold off on the planned increase in tariffs. He also said that China has to open up to the competition from the US. He added that if his meeting with President Xi Jinping on the sidelines of the G20 Summit was not successful, the US would put additional tariffs on another $267 billion of Chinese imports. What is your response to his remarks and what is your expectation for the upcoming China-US summit? A: The Chinese side has repeatedly stressed that the China-US economic and trade cooperation is mutually beneficial in nature. China is willing to resolve the trade issues though negotiations on the basis of seriousness, equality and good faith. Meanwhile, we will firmly safeguard our own legitimate rights and interests. Not long ago, President Xi Jinping and President Trump talked by phone, during which they had an in-depth exchange of views on China-US relations and issues of mutual interest. The two heads of state agreed to seek a solution which is acceptable to both sides on the trade issues. Now the economic teams from the two countries are in contact to implement the important consensus reached by the two heads of state. The China-US summit is just around the corner. We hope that the US can meet China halfway and follow the consensus reached by the two leaders at the telephone conversation to strive for positive outcomes of this summit. Q: According to reports, Philippine Finance Secretary Carlos Dominguez reiterated at the Philippine Development Forum on November 25 that the estimated debt of the Philippines to the Chinese government by the end of 2018 will be about 0.65 percent. Even by 2022 when most of the financing for their infrastructure building program are accessed, the share of loans from China will only account for 4.5 percent of the Philippines total debt. Therefore, there is no danger of the Philippines being drowned by Chinese debt. What's your comment on this? A: We appreciate relevant remarks by Finance Secretary Carlos Dominguez. Indeed, China's loans only account for a very limited share of the Philippines' foreign debts. It's impossible for the Philippines to fall into the so-called "debt trap" due to these loans. China has financed relevant infrastructure projects at the request of the Philippines, which meets the needs of the Philippines' economic and social development. We believe the relevant projects will further improve the livelihood and boost economic growth of the Philippines, providing new impetus for its national development. China and the Philippines are close neighbors facing each other across the sea. In recent years, the China-Philippines relations have continued to improve and brought tangible benefits to the two peoples. No long ago, President Xi Jinping paid a successful state visit to the Philippines, during which the two sides signed around 30 cooperation agreements in the fields of infrastructure, energy, agriculture, etc. Following the consensus reached by the two leaders, the two sides will continue to deepen practical cooperation in various areas to achieve common development and deliver benefits to the two countries and peoples. Q: A group of 278 scholars from dozens of countries have called on countries to hit China with sanctions over the mass detention of Uyghurs in Xinjiang. What is your comment? A: Regarding the Xinjiang-related issue that you are interested in, China has made clear its position many times. We have also released a white paper and I would like to refer you to that. Here I want to stress that Xinjiang now enjoys social stability and economic growth, and the people there live a happy life. The relevant measures taken by China aim to combat terrorism. 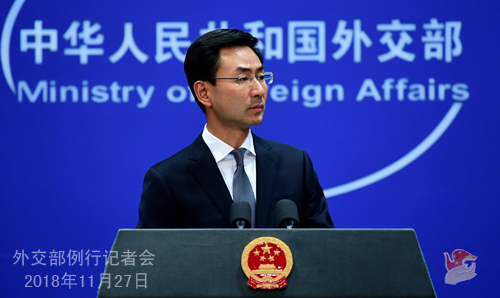 We are firmly opposed to any foreign force meddling in Xinjiang-related affairs and China's domestic affairs. Q: What is your take on the genes-modified babies in China? A: This is not a diplomatic question. I believe you may have noted that China's National Health Commission has made an official statement. Q: Could you just clarify what is the nature of the consensus reached between President Xi Jinping and President Trump? A: Like I just said in my previous reply, during their telephone conversation on November 1, the two heads of state agreed to seek a solution which is acceptable to both sides on the trade issues. According to my understanding, the two heads of state have also instructed their economic teams to enhance communication. Now the economic teams from the two countries are indeed following through on the consensus reached by the two heads of state. Q: Do you have any data or any evidence that the crackdown on the production and distribution of illicit fentanyl is working? A US Congressional panel has issued a report saying that China has failed to contain the distribution of illegal fentanyl and remains the biggest exporter of fentanyl to the US. What is your comment? A: Your question involves a professional matter. I just have some materials at hand provided by the relevant department, and I believe I can give you a fairly detailed reply. China has always attached high importance to the trafficking and abuse of fentanyl-like substances and proactively taken effective measures to handle the issue. First, we have strengthened the management and control of fentanyl-like substances and their precursors. Although there is no abuse of fentanyl-like substances in China, we have actively taken measures to list and control them. By far, China has included 25 fentanyl analogues and two precursors into its list of controlled substances. Second, we have enhanced intelligence sharing with other countries. 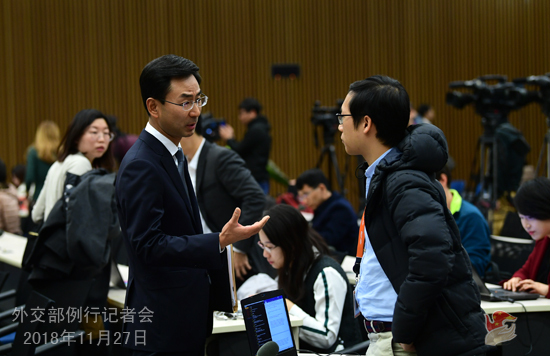 At a meeting on drug control intelligence sharing between China and the US in October last year, China offered the US over 400 pieces of intelligence regarding the purchase of fentanyl. As to the leads for fentanyl selling provided by the US, the Chinese law-enforcement agencies have also proactively sought verification of them and given feedback to the US in a timely manner. Third, we have stepped up the search and seizure endeavour in law-enforcement. Local authorities are instructed to intensify their efforts to collect and analyze suspicious samples. They also join efforts with the customs and post services to strengthen the check and seizure of suspicious postal parcels that are sent to the US at key ports and tighten supervision over logistics and delivery services in a bid to detect and crack down on illegal activities in a timely manner. Fourth, we have reinforced the management and regulation of nuclear magnetic resonance spectrometer to effectively address the issue of fentanyl manufacturing and selling. As such equipment is mainly produced by manufacturers in the US, we hope the relevant US authorities will actively cooperate with the Chinese side and offer us relevant information on a regular basis. I would like to point out here that the issue involving the fentanyl-like substances and other psychoactive substances is an international one. Most of the psychoactive substances are "designed" in the laboratories of such developed countries as the Europe and the US, and their further processing and consumer markets are mainly in these countries. The abuse of fentanyl-like substances in the US at this point results from many factors. The US government surely has a bigger role to play in reducing the demand. In addition, the US has time and again accused China of being a key source of the fentanyl-like substances at home, but never submitted any accurate statistics or effective evidence to the Chinese side, and the intelligence and leads they've offered are very limited. I would like to again call on countries around the globe to jointly study and vigorously address this international problem of the management and control of psychoactive substances with the principle of comprehensive, balanced and shared responsibility. Last but not least, I shall stress that the drug issue, including fentanyl-like substances, is a global problem. The anti-drug cooperation is an international consensus. The Chinese government attaches high importance to the collective global management of the drug issue and actively cooperate with the US and other countries within the framework of United Nations Convention Against Illicit Traffic in Narcotic Drugs and Psychotropic Substances and its domestic laws. The anti-drug cooperation also makes a highlight and model of China-US law enforcement cooperation. We stand ready to continuously strengthen our communication and cooperation with the US in this area.